Chicken Jokes - Tons of them! 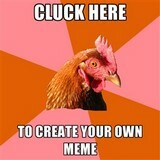 M.C.Escher : That depends on which plane of reality the chicken was on at the time. Salvador Dali : The Fish. Werner Heisenberg : We are not sure which side of the road the chicken was on, but it was moving very fast. L.A. Police Department : Give me ten minutes with the chicken and I'll find out. Grandpa : In my day, we didn't ask why the chicken crossed the road. Someone told us that the chicken had crossed the road, and that was good enough for us. Bill the Cat : Oops... Ack. Q: Why did the Roman chicken cross? "Free Chickens. Our Coop Runneth Over."